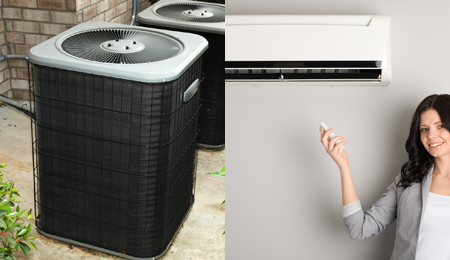 Central Air Conditioning Maintenance | A/C Unit Repair | Whitney Bros.
As your trusted heating service provider, Whitney Brothers can also keep your home comfortable each summer with our professional cooling services. For year-round energy service, look no further than the reliability of your local energy expert, Whitney Brothers Heating & Air Conditioning. Just like tuning up your heating system before each winter, scheduling maintenance for your air conditioning system each spring can help significantly improve your home comfort and energy savings throughout the summer. Replacing air filters and inspecting worn parts within your cooling system are simple, affordable updates that can be made quickly to improve your equipment’s performance. In addition to keeping your home cool, a properly maintained cooling system can also help improve your overall indoor air quality. Why be so concerned about the inconvenience of an air conditioning system breakdown on the hottest days of summer? We are here to service your A/C system. It is our priority to keep your home and family cool and comfortable each summer. As your local service provider, we will be on site promptly to repair your cooling system as quickly as possible! New technologies in cooling equipment are offering more options than ever before for your summer comfort. The experts at Whitney Brothers Heating & Air Conditioning can help you determine which type of system is best for you. An updated air conditioning system can save you up to 30% on your summer energy bills and can provide you with years of cool summer comfort. You may also be eligible for state rebates for your energy-efficient upgrade! Mass Save® is offering 0% financing and rebates on ENERGY STAR qualified central air conditioning systems, heat pumps, and ductless mini-split systems! For whichever ENERGY STAR cooling system best fits the needs of your home and family, our fully licensed technicians installs your equipment professionally to keep you cool this summer and for years to come. Ask us about energy-efficient Mistubishi products!